If you’ve spent any time online recently (which you have since you’re reading this) then chances are that you’ve been exposed to some great marketing ideas from at least several companies. It can be inspiring to see the ideas that these companies come up with to market their products but frequently we are left with an empty feeling if we’re not careful. After seeing these campaigns over and over again we are constantly being exposed to the best of what companies have to offer. It can lead to the belief that every idea a person, or company, has is always the perfect solution to a problem. This is not the case. For every idea that works there are hundreds, and even thousands, of ideas that didn’t. 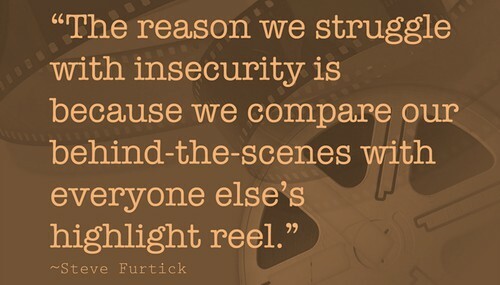 The problem comes when we start to compare our own choices and lives with that of what we are seeing online. These companies have teams of people working full time to come up with a solution to a problem, which results in the end product that is displayed on your screen. To say that every decision you make is a failure because it doesn’t compare to what you are seeing online is a terrible mistake. Realize that along with an incredibly large amount of discarded ideas comes an incredibly large amount of time. This means that when you get down to the nitty gritty and long hours life isn’t as glamorous as you may think. The beauty comes in falling in love with the process and continuing to do the great work you were always meant to do.